For a while now I've been meaning to post a few thoughts I wrote down after an early viewing of the 1981 film Peter and Paul, and seeing as Paul, Apostle of Christ was released on DVD and blu-ray last week, this seemed an opportune moment. As with the last time I posted some old thoughts on this film, the thoughts below date back at least a decade so they perhaps don't reflect what I would write about the film today, but I thought it might be of interest to some, and in any case I'm trying to gather up some of the bits and pieces I have written elsewhere on the internet that have subsequently disappeared. It's actually interesting to me how much I have moved on from the kinds of things I wrote then, and how the film then taught me, or helped me understand other things, that I've come to just take for granted in the meantime. These thoughts were originally posted at a discussion forum, so please forgive the change of tone, but (spelling mistakes aside) I wanted to preserve the original as much as possible. I found it interesting that the film stresses the change of name being from the Hebrew Saul to the Roman Paul. I'd never really twigged that that was what went on. It certainly makes more sense of where the name change occurs in Acts, which was something that had always puzzled me. I found the stoning scenes quite interesting as well. In Jesus films we never really see one (save Life of Brian of course which doesn't really help factually), only Jesus stopping one. Here we see a few, and there are a few interesting details. In one of them its actually a woman who throws the first stone which I thought was a curious twist on John 8. One thing I've always wondered is how come Paul survived so many stonings. I mean unless you run out of rocks or the stoners have a really bad aim, it's difficult to visualise. And the film did this well. (FWIW I'm sure that at one point the actor who plays Steven is an extra who throws a stone in another scene - irony). Also interesting that in some of the scenes the crowd gets stoned just for being there. The way the restrictions get handled is thought provoking as well. I guess going into the film I thought Paul had agreed on certain compromises which he then seems to flout later in his letters. 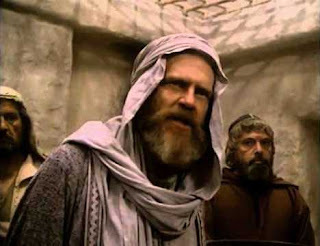 The film takes the view that the Jewish church rejects salvation by faith alone, but agrees with Paul pretty much, but then quickly goes back on it, leading to the argument with Peter and Paul from Gal 2. I presume their version of things sees Acts as airbrushing, or rather consolidating a longer debate into one incident. The slave girl of Philippi here is "gifted" rather than demonised, and this generally fits with the way the film downplays the supernatural elements of the story. 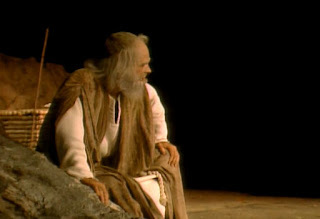 So Pentecost occurs before the film, the visions are restricted to bright lights, Paul's sight is restored but it only looks like some dried skin is soothed or something, the death of Annanias and Saphira is ignored (again, a bible film that cuts out the troubling bits), Peter's escape from jail is an earthquake rather than an angel, the supernatural intervention surrounding the shipwreck is missed out and we just see them washed on to the beach. There are some supernatural elements, but they are generally sidelined. Its particularly interesting then that the film gives us the definition of a miracle as an "event that produces faith"
As I think I said above one of the things I liked about the film was the way it worked later themes in as if Paul is developing them, or coining them and coming back to them. I particularly liked the way it works 1 Cor 1 in there. (one day I might do a film series / or essay on the use of this passage - it also occurs in The Mission, Three Colours Blue and Four Weddings and a Funeral). I was also surprised that Cornellius' vision was absent. It seems to me that Acts really hinges on ch 8-10. The execution of Stephen forces many members of the church to leave Jerusalem and thus take the message further afield, then Paul is appointed to the gentiles and Peter has his vision. This film makes little of the first aspect, and nothing of the last. I also thought the dispute between Paul and Barnabas was handled effectively and the whole portrayal of Paul as a great man, but one who is flawed is the films real strength. One other thing I though was interesting was how at times the film casts both Peter and Paul as Jesus, through certain scenes / shots that are very reminiscent of Jesus. Peter gets this early on in an upper room, and Paul somewhat later on as he stands silent before Nero. Somewhere between about ten and twenty years ago, I picked this up, on VHS. I imagined, perhaps purely from the title, that it would be a film or TV series adapting the Book of Revelation in a similar fashion to that to Raffaele Mertes' The Apocalypse (2000), the final entry in Lux Vide's The Bible Collection series. Mertes' film, made its central character St. John (played by Richard Harris), but devoted a good deal of its running time to fairly literal enactments of his prophecies. As much as I was curious to see what an even cheesier version of this film looked like I only got around to finally watching it this week. I've trying to fill a few gaps in a list of Bible Films and this was one of the remaining few. But after such a long period of mild anticipation, I must admit I was somewhat disappointed to discover that this was not at all cut from the same cloth as the Harris film. For a start, St John in Exile (1986) turns out to be a filmed performance of a live show - a one man play featuring Herbie star Dean Jones at the apostle in his final days on Patmos. Here, however, the disciple is not primarily recounting the visions he has seen - although they do feature, but recalling the full array of biblical material to which John's name has become attached. The largest chunk of the film, then, belongs to his retelling of the life of Jesus. There follows a few brief excerpts from the three letters of John, but, in contrast to my initial expectations, very little of Revelation. Jones' performance is fine here, even if it's difficult to imagine the real John being a folksy American farmer. The script nicely breaks up its more intense sections with humour, and the live audience clearly find bits of it hilarious. And there are certainly a few good lines, such as the description of Peter as "a walking bundle of outrageous extremes". What works less well however is how the persona Jones creates tallies with the actual texts. "John" is presented as the author of Revelation and the fourth gospel, but doesn't sound like either. In particular, his reflections on Jesus' life don't sound at all like the fourth Gospel. The play is smart enough to recognise the similarity of the synoptics, and even makes sort-of jokes about how unlikely it is that they will ever be bettered, but doesn't really seem to appreciate the form and content of John's Gospel. Jesus as described like Jones talks in shortish synoptic like sayings and stories, rather than the long monologues which form the majority of John. Not dissimilarly, in trying to connect the Book of Revelation to the amiable character Jones creates, it too loses a bit of its power. There's clearly a reasonably conservative approach behind all of this. Whilst many scholars question if the Gospel, Revelation and the three letters could really be the work of the same author the belief persist in conservative circles which prioritise the Bible's integrity and the traditions around the Bible over modern methods of literary analysis. Unfortunately, the failure of works like this to fashion a credible composite portrait from the diverse sources, do rather cut away the ground on which they are built. Of course the idea that an author cannot write in a variety of styles is hardly compelling, and the character that Jones and his writer Don Berrigan manage to create does feel like a credible "real person". It's just that this person feels far more like the writer of the letters than of the two more famous works. As a result, ultimately it tells us more about modern Christianity than it does about the first-century, and more about the other bits of the Bible than the one that many would have expected. Incredibly, even before 1910 there had already been seven silent film adaptations of the story of Herodias' daughter including four release in 1908 alone.1 The oldest of these seven, the German film Tanz de Salome dates all the way back to 1902, three years' before Strauss' famous opera was first performed. Given the opera's popularity, it's not entirely surprising that so many films about the subject were released, nor that Blackton, Capellani and Feuillade were among those to give it a go. Nevertheless, 1910 saw the release of two more films about Salome: Herodiade a French effort by Alice Guy's former assistant, Victorin Jasset; and this Italian-based film by Ugo Falena. At the time Falena was working for Film d'Arte Italiana, which as a studio was very much back in third place behind Italy's biggest two largest film producers Cines and Ambrosio. The film broadly follows Wilde/Strauss' variation on the New Testament tale. Certain details such as the Baptist being held in a cistern are drawn straight from the play, but it's interesting that in contrast to the play opera the cistern is a subterranean pit opposed to an above ground structure. I'm not sure where this variation originated, but it finds its way into the 1922 Nazimova film adaptation. Two elements of the plot are also added. The first is the visit of Vitellius (presumably the future emperor, though of where he is meant to be procnsul at the time of the story is anyone's guess). The other is a moment where a serving girl spills wine on Herod and is instantly dragged off, tied to stake and stabbed to death by a group of female revellers. Salome's dance occurs immediately after this incident such that the unfortunate woman's corpse is visible throughout Salomé's dance. The dance, such as it is, is preceded by Salomé (Vittoria Lepanto) removing her scarlet robe, to reveal seven veils tucked, rather conveniently, into her waistband and ends with the daughter of Herodias throwing herself on the floor at Herod's feet. John's head arrives on the platter, but the footage - at least in the versions I have seen - ends here, so it's unclear if Salomé kisses the Baptist's severed head or not. In addition to Lepanto, the film starred Ciro Galvani as John, Achille Vitti as Herod and Laura Orette as Herodias. 2 -Readers wanting to find out a little more about colour in early silent films should read Fritzi Kramer's introduction at her Movies Silently site. If you're interested in what you read here, or even if you're looking for something a bit different for your group / conference / course / church / festival then why not get me to come and speak? I've done numerous talks at all of those over the years, on the Bible on film as well as other subjects, but at the moment I'm keen to do more and happy to travel if you'll pay the costs. I'm also happy to do podcasts. In the past I've taken sessions on specific films, or about depictions of Jesus in film at various levels up to and including undergraduate; I'm published on depictions of David in film, Roberto Rossellini, the history of the Bible on Film and men in movies. 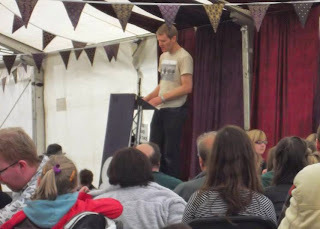 In addition to the Bible and Film I've spoken on in before include numerous talks on the Bible and poverty, as well as talks for Greenbelt festival on the Bible and mental health and the problem of violence in the Bible. Most of my talks have been at churches, but I've also spoken at schools, universities, film clubs and conferences such as Spring Harvest. I also featured on the Channel 4 documentary The Passion: Films, Faith and Fury. I'm pretty flexible in terms of subject, and I always bring a creative and interactive approach to my presentations, combining clips, strong visuals and group interaction with speech. Obviously this depends on your dates being available and I reserve the right to turn down any bookings, but this is a genuine offer. So long as I'm not out of pocket I won't sting you for more money down the line. Still interested? Drop me an email. I'd love to hear from you. Such was the unexpected financial success of Monty Python's Life of Brian that other filmmakers quickly decided to follow suit. With the taboo broken, and most of the objections to irreverent biblical comedies having already been faced down, producers Freddie Fields and David Begelman, the ex-president of Columbia, hastily developed plans for a comic film which would appeal to a similar audience. For Begelman it was also a shot at redemption following his sacking from Columbia for forgery. Teaming up with writer Guy Wood they devised a movie that traced the contours of Python's film, only relocating the story to the time of Moses rather than that of Jesus. Wholly Moses shows a staggering lack of originality in this respect. Not only is it a biblical spoof, which also happens to star a famous Oxbridge comedian, but it's a film where the hero's life comes into very close proximity with a famous biblical figure. Whereas Python's Brian is mistaken for the Jewish Messiah, so this film's lead, Herschel (Dudley Moore), tracks the life of Moses. On the day that Moses' parents set him adrift on the Nile, so too does Herschel's father place his son in an ark on the river, only for the baby Moses to nudge Hershel's basket past the princess's palace. As an adult Herschel also has to flee to the desert where he meets Jethro and marries one of his daughters, Zrelda. Shortly afterwards Herschel mistakenly hears a voice from heaven instruct him to set his people free, without realising that the voice's intended target, Moses, is getting the full works around the corner. Sadly the one aspect of Life of Brian which the team behind Wholly Moses fail to reproduce is the sharpness of its humour. Not only are its jokes fewer and less pointed, but they are also not very amusing. Moore always seemed somewhat bereft when separated from his comedic partner Peter Cook. His success in 10 the year before was due more to its melancholy romantic elements more than its humour. His other major success, the Jeeves and Wooster-esque Arthur, (1981) owes its success as much to John Gielgud's waspish valet as to Moore's alcoholic millionaire. Here he later reflected that he had "allowed himself to be flattered and 'wet-noodled to death'" (Paskin 203). That said, the lack of humour is not so much Moore's fault, as Wood's script. There are perilously few good moments in the script, as evidenced by the fact that Richard Pryor also struggles in his cameo as Pharaoh. Director Gary Weis had a strong track record with comedic material from his time at Saturday Night Live (along with the film's female co-star Laraine Newman), but in his first proper feature film he struggled to pull things together or make the most of the comedic talent at his disposal. As the film's problems became apparent various changes were discussed to try and get things back on track. At one point there were plans to add a narrator. Whilst that idea was never fully developed, eventually the filmmakers decided to add modern day scenes at the start and the end of the film. As with Jesus Christ Superstar (1973) the narrative starts and ends on a bus in the desert. Their Moore's language scholar Harvey Orchid, strikes up a friendship with Newman's character Zoey. During an unscheduled stop the pair wander off and stumble across some ancient scrolls telling Herschel's tale. Whilst Weis' direction is pedestrian, cinematographer Frank Stanley, who had worked with Moore on 10, does manage to capture some nice scenes of the blue skies over Death Valley. Occasionally the odd bit of slapstick works and fans of DeMille's second version of The Ten Commandments (1956) will appreciate the recycling of it's famous dictum "So let it be written. So let it be done." Despite numerous troubles on the set and a critical slating, the film performed impressively during it's opening week, though business quickly trailed off. Orthodox Jewish groups however called it "the most vicious attch on the Jewish religion in the history of the American movie industry" (Paskin 205). Undeterred, the following year, the Jewish writer and director Mel Brooks featured Moses in a short scene in A History of the World: Part 1, where a butter-fingered Moses drops a third tablet leaving commandments eleven to fifteen smashed on the floor. It's a scene that in seventy seconds manages to conjure up more laughs than Wholly Moses does in over an hour and a half and carved out its place as comedy's most memorable depiction of Moses. Moore struck gold with Arthur, and Begelman went off to be head of MGM. Weis and Wood barely worked in the movies again.